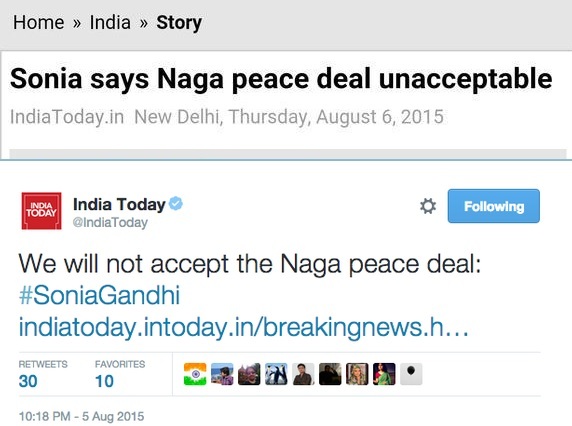 OpinIndia has done a yeoman’s service by compiling #presstitutes’ blatant lies in the month of August. 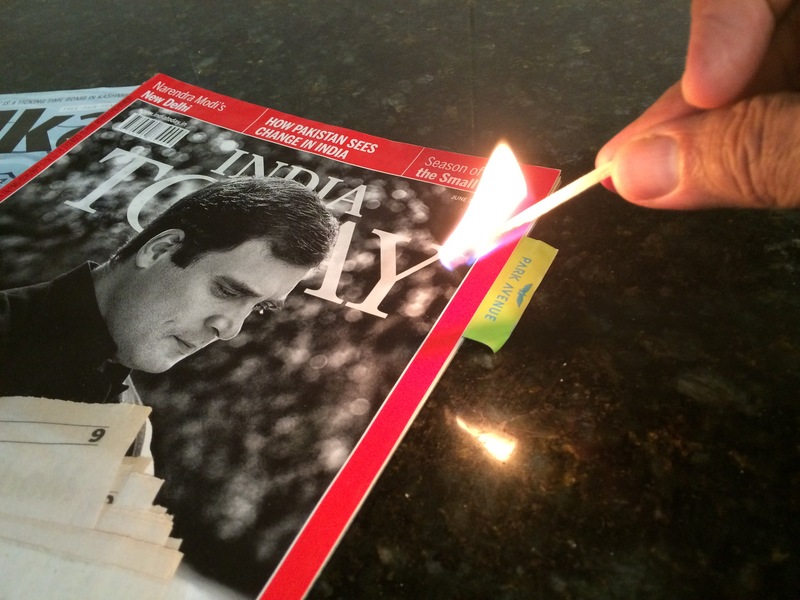 One can use this to silence those who use the epitaph Modi-Bhaktas for those who criticize the Mainstream Media. 1. 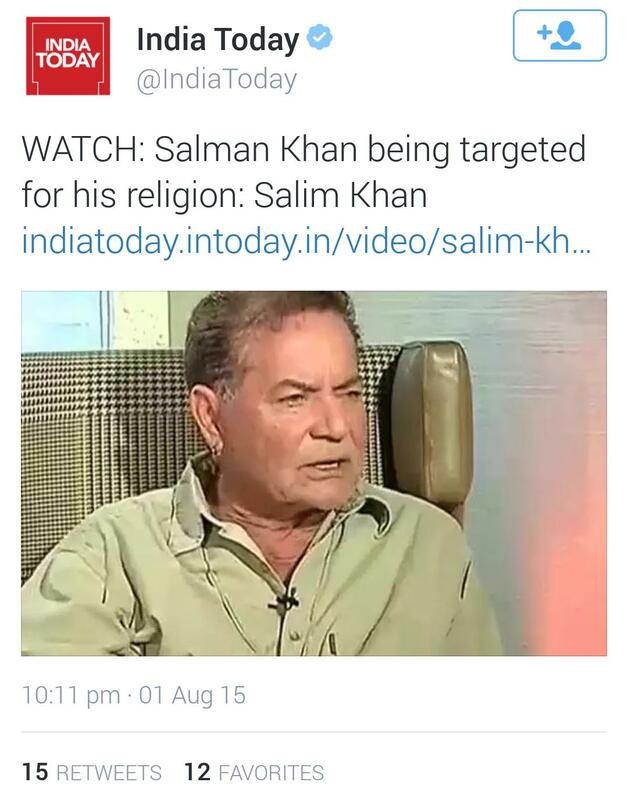 1 August 2015: India Today group – Salim Khan says Salman being targetted for his religion. India Today ran an interview of Salim Khan done by Rajdeep Sardesai and presented a blaring headline that Salim Khan says Salman is being targetted because of being a Muslim. There were two interviews done, one in English and one in Hindi. Initially the English interview was released. In this version Salim Khan doesn’t even come close to saying anything like this. Yet, as seen in screen-grab of the same interview, the tickers claim he said something like this. Rajdeep: Is Salman a soft target because he is a Muslim? Salim Khan: Not only Muslim, Muslim and a celebrity. If an ordinary Muslim from behrampeda or bhindi bazaar would have given this statement, would this road be closed then? This story began with an ANI News report which said in Rajasthan in a class III textbook, Asaram was listed as “Country’s famous saints”. Hindustan Times went ahead with this story and for reason claimed that this was found in an NCERT textbook. They even got quotes from various individuals panning the NCERT board. Fact is, if one checked the NCERTtextbooks for class III from Rajasthan, such a chapter is not present in any of the books. 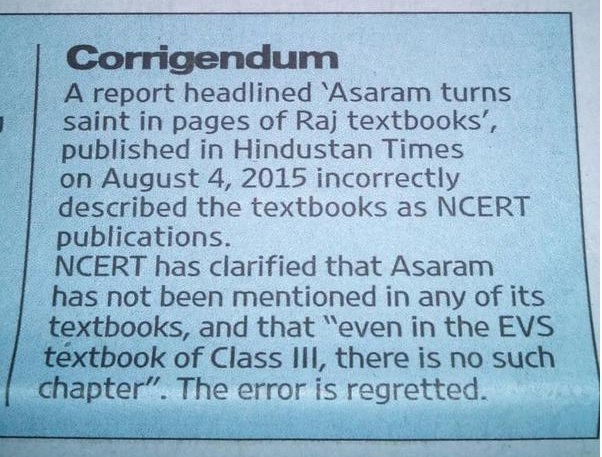 Eventually, the Hindustan Times published a small corrigendum apologising for their incorrect report, although the web version still carries the wrong report. This was after the MHRD forced them to issue a corrigendum. mandated that all officials be present at the PM’s Independence Day speech. 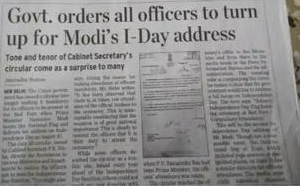 Although this is a routine cricular, The Hindu made it sure that it would alarm you by adding a theme to this news that suggested this circular had “surpised many by its tone and tenor”. 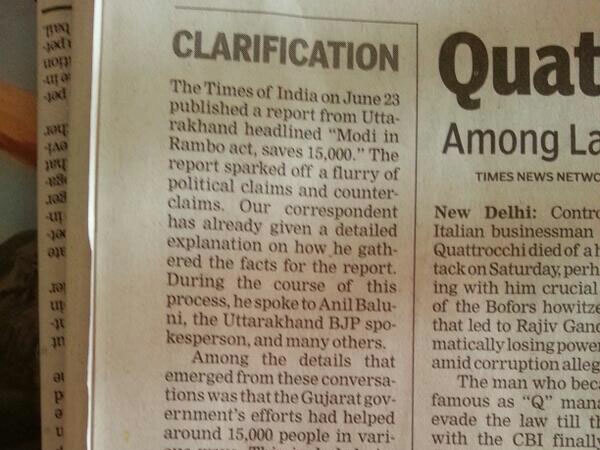 As it turns out, a few days after this front page burst, The Hindu had to publish a small clarification in the inner pages which said that their earlier story was an “exaggeration of facts” and that the circular in question was in line with the “standard practice”. 5. 11 August 2015: TheWire.in – BJP, Including Modi when he was CM, blocked GST for political ends.This claim has been made repeatedly by Congress leaders but it was surprising to see a news site take this stand too. We had written a separate post on this, where we showed via news articles of the time, that Non-BJP states including Congress states had opposed UPA’s GST bill for various reasons. Also, the BJP states which did oppose GST then, had clearly spelt out their reasons and demands, and since these demands were now satisfied and the GST bill was amended, they had supported this revised GST. TheWire.in did not include both these facts in their one-sided post which was written by M K Venu. 6. 15 August 2015 : Mail Online – The terrible plight of Indian elephants In the above piece, it was claimed that Elephants are tortured at the Guruvayur temple in Kerala. It claimed that Elephants were “Chained to the same spot for 20 years, Beaten into submission at secret jungle training camps.” All the claims made in this article were demolished in a detailed post by Prem Panicker on a blog. 7. 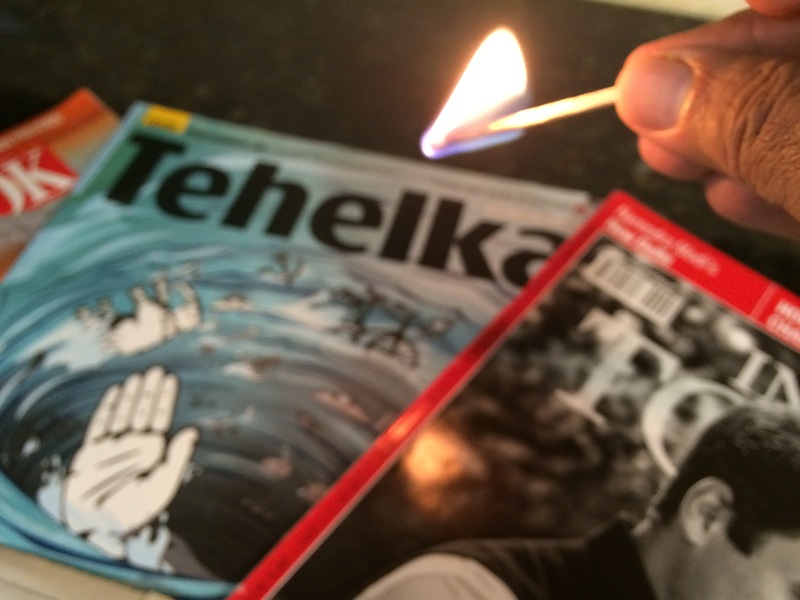 18 August 2015: All Media – Major relief for Congress in National Herald case, sources say Enforcement Directorate will close it We had written a separate post on this, where we showed hoe various news sites like CNN IBN, India Today, Firstpost and Zee News had misreported this news. First of all, none of the stories highlighted the fact the National Herald case with the ED was different from the National Herald case going on in courts. Secondly the ED never had any open National Herald case, so question of “closing” it never arose. ED only refused to file a PMLA case in the issue on “technical grounds” and since it felt it was too early. Some reports suggested this was due to “lack of evidence”. Keeping in mind all these distortions, the use of the phrase “major relief” was highly misleading. 8. Reuters and then Indian Media – Pakistan cancels Commonwealth conference to highlight ‘Kashmir issue’ The story begins with Pakistan, the host nation, not inviting the J & K speaker at the Commonwealth conference in Islamabad. To this, India objected strongly and threatened to boycott the conference. Now, as per the Reuters report (which was written by a Pakistani journalist based on inputs of Pakistani officials), Pakistan cancelled the conference “to raise the Kashmir issue”. This was perceived as a “hardening of stance by Pakistan”, to “provoke India“, by many Indian MSM outlets. Fact is, Pakistan did not cancel the conference. The Commonwealth Parliamentary Association (CPA) issued a statementthat the Executive Committee cancelled the meet because Pakistan did not invite the J & K speaker. In fact, certain sites like The Hindu and CNN IBN even reported that This should have been considered a out of members of the CPA executive committee voted to cancel the talks because Pakistan had ” violated the CPA constitution by not inviting an eligible member” . This was a diplomatic win for India, but it was portrayed in the media differently. 9. 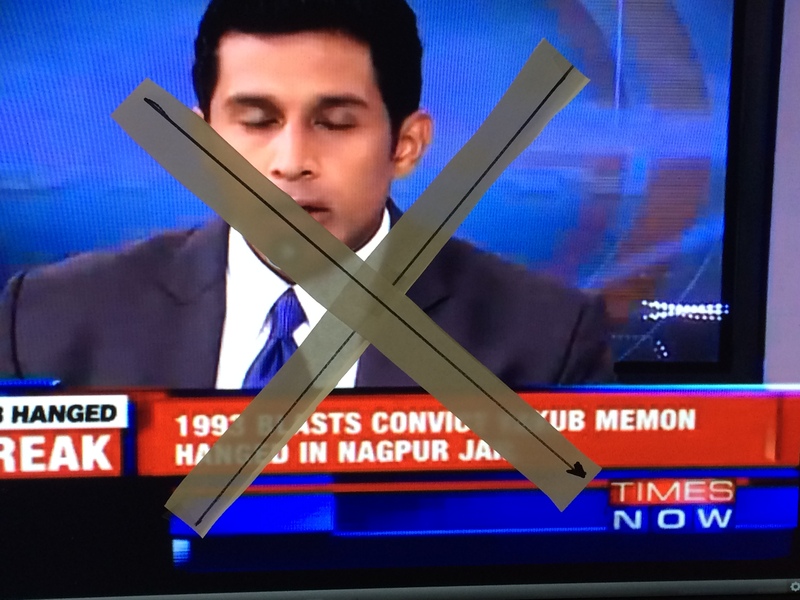 21 August 2015: All Media – Misbah Quadri denied flat in a Mumbai colony for being a Muslim. This news broke in May 2015. Soon after it surfaced, follow up reports suggested the story was false but only now has the story been proved to be false. Quadri had then claimed that she was being discriminated against because of her religion and was not being given a flat in a colony. The media did not employ any sort of fact check and blared the story all over. Later some outlets like Hindustan Times & Mid-day decided to look at the other side and did not find evidence to back her claim. 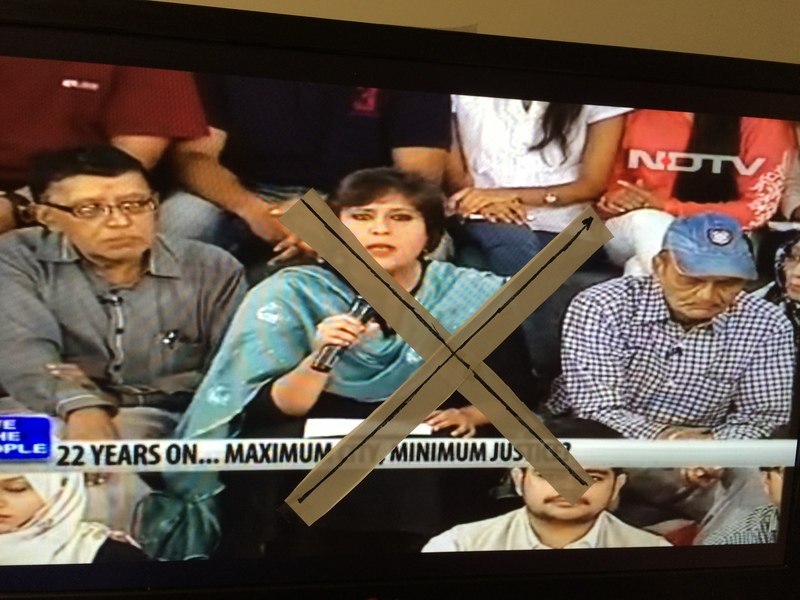 Now, the cops have finished the investigation and found no evidence to support her claim. There were other Muslim families living in the same colony and none had been persecuted. 10. 21 August 2015: Times Now Congress Sweeps Civic Polls in Rajasthan First the cold facts and figures: In the Rajasthan Civic Polls, BJP managed to win clear majority in 66 of the 129 local bodies, and claimed to be able to form the board in another 14 bodies. Even if we take 66, it is above the 50% of 129 and can surely mean only 1 thing. 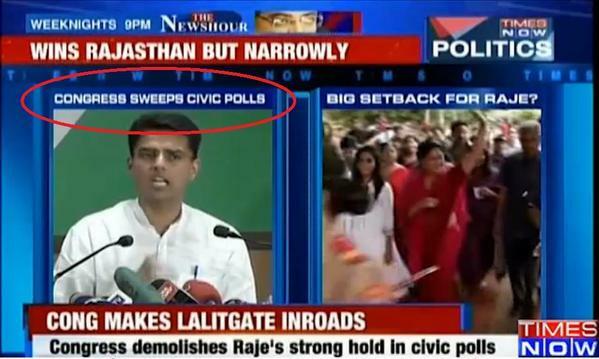 Yet, Times Now had this coverage: “Congress Sweeps Civic Polls, Makes Lalitgate Inroads “. To add to the joke, On the very next day, Times of India carried a story in print as well as online, which contradicted Times Now. 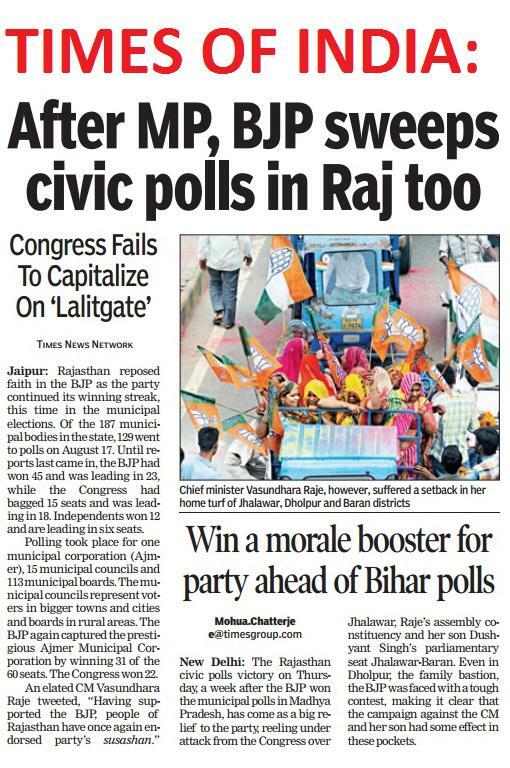 It said “BJP sweeps Civic Polls in Rajasthan, Congress fails to capitalize on Lalitgate”. Yes 2 media outlets from the same group had 2 different interpretations of the same set of numbers! 11. 21 August 2015: PTI – India’s GDP Can Double in 3 Years: Railway Minister Suresh Prabhu PTI claimed that Suresh Prabhu, at a fucntion in Kolkata claimed that India’s GDP can double in 3-3.5 years. Simple arithmetic would show that to achieve this India would have to grow at a minimum of 20 odd % per year (compounded annually). Even the improbability of this figure did not throw off PTI. Hence, Minister Suresh Prabhu had to clarify on twitter. He said this was a case of “complete misreporting” and he had said it would take 6-6.5 years for GDP to double. He also expressed his frustration that so many sites were carrying PTI’s wrong report. We could find 2 sites, which relied on an IANS report, which correctly reported that Suresh Prabhu had 6-6.5 years. 12. 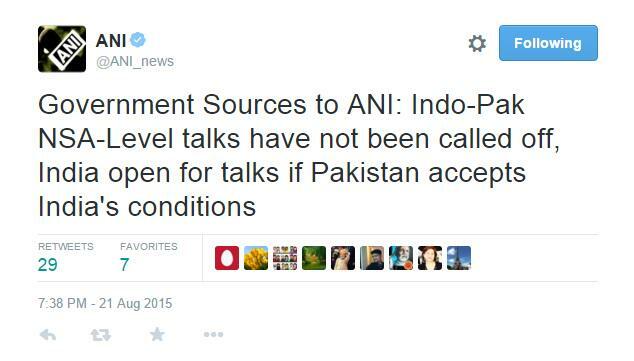 21 August 2015: PTI – India calls off NSA level talks with Pakistan. PTI reported this Breaking News which was soon picked up by all media outlets. It was based on PTI’s interpreattion of India’s strongly worded response to Pakistan’s statement on the NSA level talks. India had only said that they cannot talk if Pakistan does not honour its commitments, but PTI in the hurry of being the first to break this news, misreported it completely. ANI News, was 3 minutes late as compared to PTI, but had the facts right after they confirmed the same with Government sources. The key word here is “averred” which both the media outlets seem to have misunderstood. “Averred” means to have been “stated” and in legal parlance, means “allege as a fact in support of a plea”. In the current context, the judge had said that the defendant i.e. Commando Surinder had stated that the case was of political vendetta. It was not the judge’s observation, as interpreted by Janata ka Reporter & Hindustan Times. Also, the reason for giving bail was that “none of the offences for which they have been booked were punishable with jail term for more than seven years and there was no chance of their absconding or fleeing from justice“. 14. 24 August 2015: All Media – The “Pervert” who “molested” Jasleen Kaur This case is far too well known now. Mid-day , DailyO & Times Now called him a “Pervert”. His crime was reported to be “sexual harassment” and “molestation”. These are just a few examples but media, relying only on the version of Jasleen Kaur branded a Delhi youth as a criminal. All this, even when Jasleen’s first tweet only claimed that the guy had made “obscene remarks”. Later, an independent eyewitness trashed Jasleen’s version and said although the guy might have violated a traffic law, it was a standard altercation between Jasleen (who was volunteering to be manage traffic) and the guy. Many more issues further came up and slowly Jasleen’s claims seemed to be exaggerated to the say the least. But MSM had ruined the “pervert’s” name on the very first day, without a basic cross check. 15. 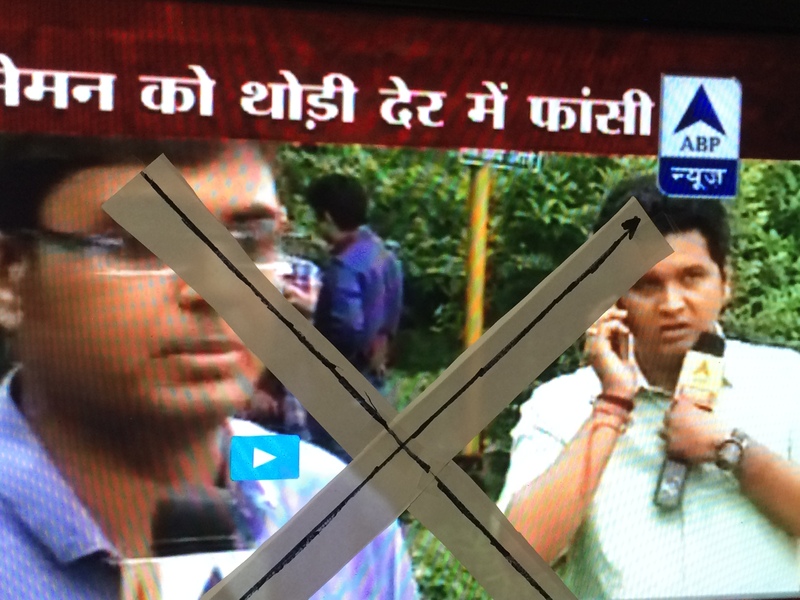 26 August 2015: All Media – Sensationalised reporting of Census data. “Lies, damned lies, and statistics”, is an age old phrase, and Indian MSM, when faced with huge data like the Religious Census figures, used all sort of twisted arguments to present whatever they wanted. Some like The Hindu andNDTV reported that “Muslim population growth slows” while not mentioning that Hindu population rate of growth also fell, and Muslim rate of growth was still the highest among all religions. PTI claimed that “Hindu population declined”, but the fact is the absolute population of Hindus grew, only the proportion of Hindus declined. 1. 3 August 2015: PTI – Sonia pulls up Agriculture Minister for ‘outrageous’ statement on farmers’ suicides This PTI report was carried by Mid-day as it is , and was later changed by Mid-day when the error they carried from the PTI story was pointed out. The report said “Sonia pulls up Agriculture Minister”. Since Sonia neither appointed the minister, nor is in power, she couldnt technically “pull up” the minister. Mid-day editor Sachi Kalbag accepted the error and changed the headline later. 2. 4 August 2015: CNN IBN – BJD joins JDU, CPI, CPM, RSP, NCP, TMC, AAP & Congress protest against suspension of MPs from LS IBN claimed that along with other UPA faithfuls, BJD too protested against the suspension of Congress MPs from the Lok Sabha for unruly behaviour. Fact is BJD did not join the protest. This was pointed out by numerous twitter users and even BJD MP Baijayant Jay Panda refutedthis news. 3. 5 August 2015: The Hindu – Right-wing group attacks FTII This lie is actually from July but since we did not notice it then, it is being reported now. As can be seen from the attached screenshot, The Hindu had reported that “Right Wing groups” had attacked FTII. This is apparent from the google search result and the byline which appears with the post. But when one actually went through the post, one could see that it clearly mentioned “unidentified vandals”. The only mention of a “right wing group” was of some group called “Patit Pavan Sanghatana”, which as the report itself says, had only rallied behind Mr. Chauhan and protested against FTII. Did The Hindu make the inference that this group itself were the vandals? If so, why did they later change their headline to: “FTII seeks police protection”. It seems The Hindu was caught on the wrong foot and then hurriedly corrected itself. 4. 9 August 2015: Dainik Bhaskar – Rahul Mahajan was a close friend of Radhe Maa. Rahul Mahajan was one of the few celebrities who openly came out against God-woman Radhe Ma, posting her pictures in “indecent clothing” on Twitter. Yet, Dainik Bhaskar in their report claimed that Rahul was once an “inseparable friend” of Radhe Ma. Rahul took objection to this false claim and clarified on twitter that far from being a friend, he had never even met Radhe Ma. Bhaskar subsequently updated their post. News reports from a section of media claimed that Zinta had told BCCI officials that some players from Kings XI Punjab may have indulged in “suspicious activities” linked to throwing matches. The reports also claimed that Zinta had said that she had felt at times that some IPL matches involving her team had followed a pre-decided pattern. Preity in her response on twitter blasted these media houses for the “inaccurate & extremely irresponsible & malicious” story. She clarified that she ahd onlysuggested random polygraph tests to prevent corruption. She also said “A constructive conversation to genuinely make a difference to the game is turned into a destructive article for sensational purpose“. She also said she was very proud of her team and under no circumstance will she tolerate slander towards her or her team. Multiple media outlets reported that “Manic Monday” on 25 August the Sensex crashed to its biggest single-day fall ever. The Sensex fell by 1624 points, nearly 6%. But this was not the biggest single-day fall, neither in absolute terms nor in percentage terms (which is more important). One of the days when Sensex had logged higher intra-day losses was on 31 January 2008 when it lost 2063 points i.e. 10.8%. There other occasions too when it recorded larger falls. 7. 25 August 2015: All Media: Anurag Kashyap gets into a brawl with MMA fighter, gets injured! Multiple Media houses (some have deleted the story now) reported that Anurag Kashyap got injured in a fight with a MMA fighter. This was absed on Kashyap’s Instagram posts where he posted pics of a bandaged eye. As a caption for one of the pics, he said: “Now they put a plaster, this is what happens when you get into a brawl with a MMA fighter”. MSM took off from here, did not bother doing a cross check into his claims and reported it. As it turns out, Kashyap revealed in a Facebook post that he was actually doing a prosthetics test for his eye and he planted the “MMA fighter” part to trap and expose the media. And the media obliged. Late on 25 August, IBN group was the only one reporting this news. 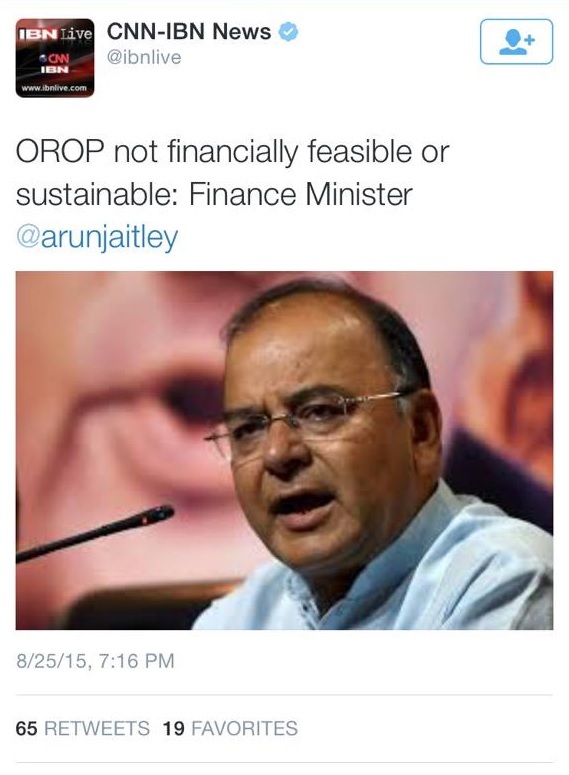 Instantly everyone assumed that OROP had been shelved since IBN reported that Jaitley, the Finance Minister, himself had said OROP is not feasible. The odd thing here was nobody else was reporting this story, no other media house. Only Firstpost, which is a part of the IBN group, reported this, that too based on IBN’s tweet itself. After a few minutes IBN deleted the said tweet. This was after BJP National Gen Secretary Ram Madhav declared on twitter that the news is false. Further, a few days later, the Defence Minister made a statement saying that only “small gaps are being filled in OROP now”. Pirzada is a Pakistani commentator who often makes anti-India remarks. But this remark was not by him. 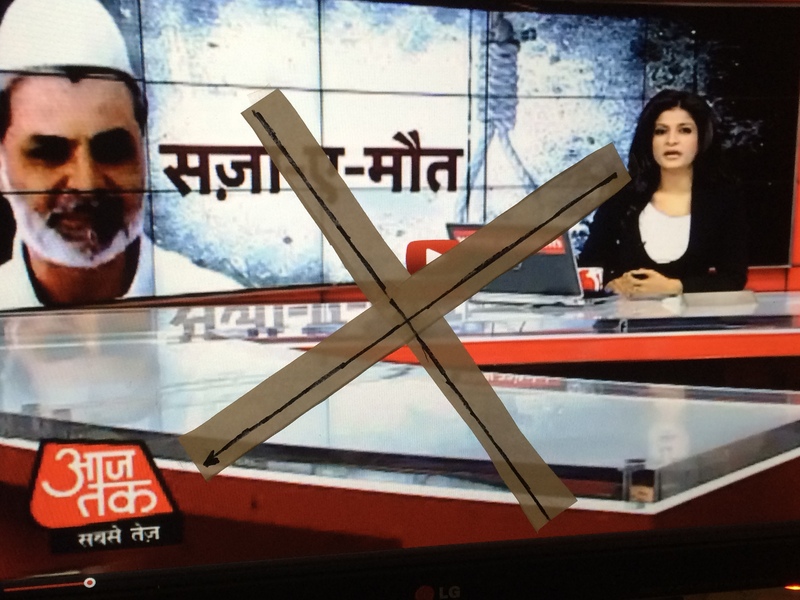 In fact it was a tweet by a parody account but IBN 7 took it to be real and manufactured a news piece on it. In their print edition, Hindutan Times published the following infographic which said population of Muslims in Gujarat had come down from 45.92 lacs in 2001 to 30.07 lacs in 2011. This sort of data fits perfectly in the narrative that “Muslims are being persecuted in Gujarat”. But this data is totally false. A look at the official datareleased by the Census department shows that the population of Muslims in Gujarat in 2011 was in fact 58.46 lacs, and the figure of 30.07 lacs reported by Hindustan Times was only of Male Muslims in Gujarat. Unintentional error? which went unchecked at multiple levels? Even when the massive drop of 34.52 % would have raised alarm bells that something somewhere is wrong? 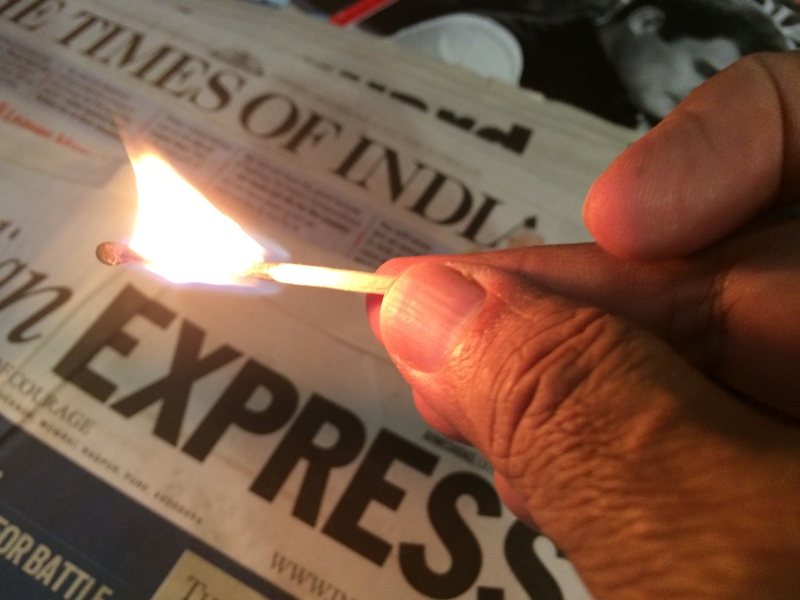 FREEDOM FROM ANTI NATIONAL MEDIA is the theme for this year’s Independence Day on Social media. Can GIBV count on your support for this? The idea is to take a selfie with a) crushed / crumpled paper b) paper flushed down toilet c) paper burning d) torn paper e) a black tape/stripe across TV screen with the channel we are protesting against f) a garland of shoes around the channel/TV screen. 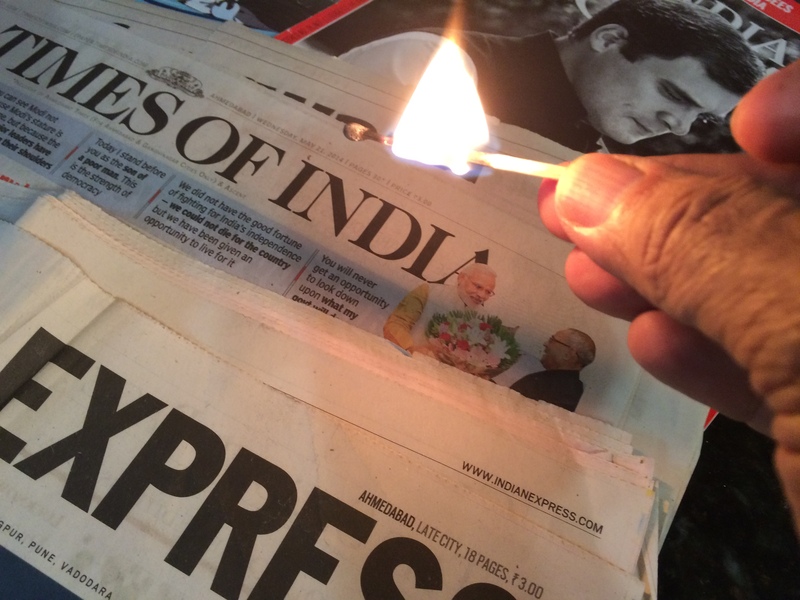 Whenever and wherever we post a selfie, it should say “Selfie in support of the NATION and against #presstitutes”. 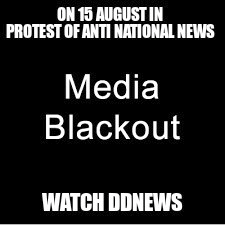 It would help immensely if all of us can make this viral in next couple of days so that on 15th August, these anti national media houses get a big message from us. 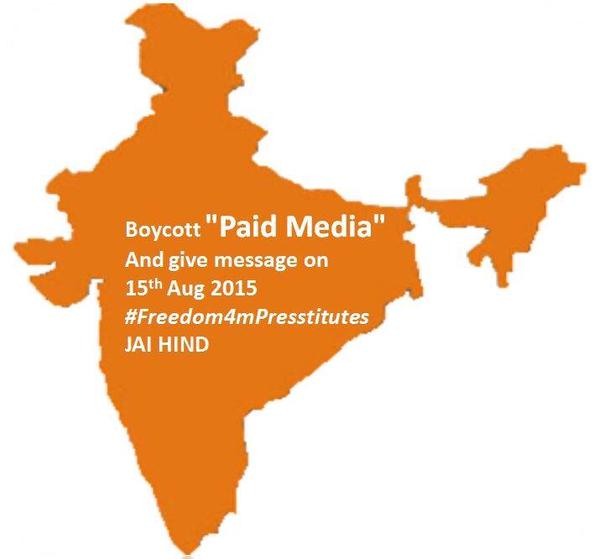 On this 15th August, let us work to achieve real freedom from anti-national, anti-majority, biased media. These are the purveyors of lies, half-truths and innuendos. These are the entities that shed tears for convicted terrorist Yakub Memon but relegate details of ex-president Dr. A. P. J. Abdul Kalam’s funeral to inside pages since front pages are occupied to glorify a terrorist. 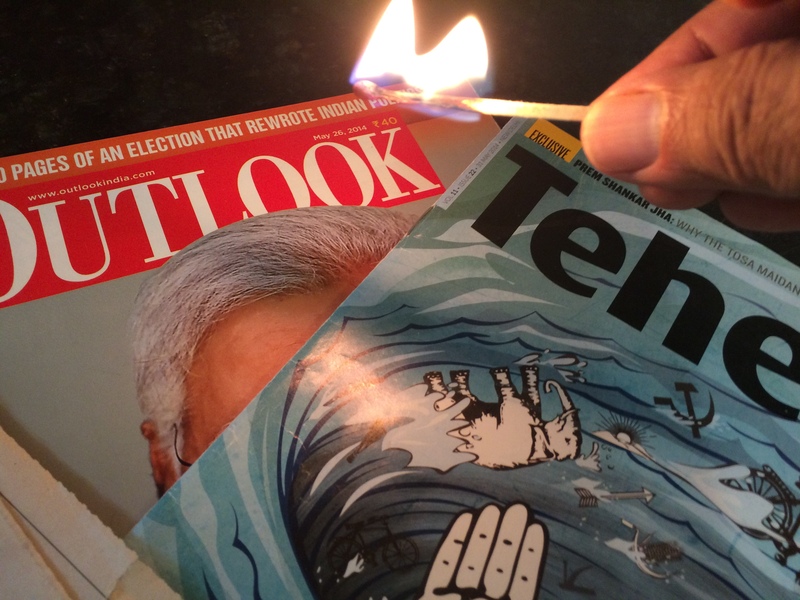 These are the entities with headline, “Then They Hanged Him”, signifying that the President of India, the Government of India and the highest judicial authority, the Supreme Court were “They” ; and the newspaper (and other paid media) were “we”, Meaning supporters of terrorist Yakub Memon. Together, we have the power to make a change. 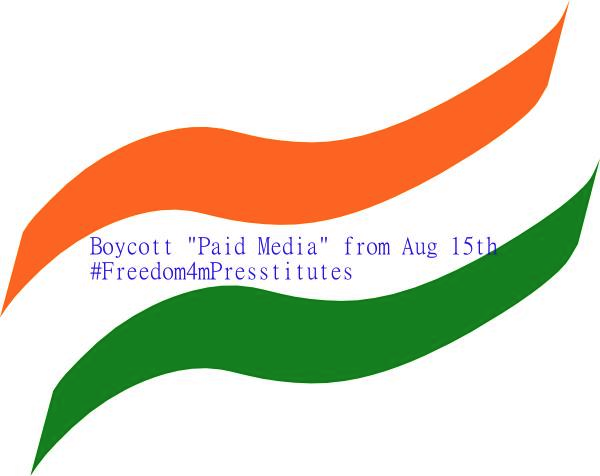 Let us use this 15th August to reclaim our true freedom from these anti-national media that has distorted any positive news of people’s and government’s achievements and supported those who are hell-bent on weakening India. This is the ‘paid media’ that is engaged in incessant war on the ethos of our motherland to demoralize the society and weaken the fabric of the society. We cannot progress and have all-round development of the country, until we force such business houses to mend their ways. Let us do it together. Please give this wide publicity on social media and in other avenues. Happy Independence Day! Thanks for your support. Irked with the question – Akhil Bharatiya Vidyarthi Parishad is the students’ wing of which political party? – asked by Big B on KBCrecently, ABVP’s general secretary Umesh Dutt has demanded a public apology from the show’s producers. ABVP strongly objected to this and wants the show to apologise for spreading wrong information about students’ organisation of India. Sunil Bansal, All India Co-organising Secretary, ABVP, told DT, “We have sent a letter to KBC team requesting them to rectify the mistake they made by asking a wrong question on their show. Unhone aise sawaal se logon ko galatmessage diya hai.